Recently retired US Syria envoy Robert Ford told CNN Tuesday that he resigned because he could not defend US policy on Syria. “I was no longer in a position where I felt I could defend American policy,” former US Ambassador to Syria Robert Ford told CNN’s Christiane Amanpour Tuesday. “We have been unable to address either the root causes of the conflict in terms of the fighting…and the balance on the ground, and we have a growing extremism threat,” said Ford, who resigned in March from the State Department after a three decade diplomatic career. Of the growing extremism threat from Syria, Ford said that he and unspecified colleagues had warned more than two years ago that Syria would prove fertile ground for terrorists. Ford said Tuesday that increased US support earlier on in the conflict to moderate Syrian opposition forces could have helped prevent extremists from getting such a big foothold in Syria. And he cast doubt on whether the increased efforts President Obama seemed to be considering ahead of his foreign policy speech at West Point last week would be enough. “It’s not clear to me yet if they are prepared to ramp up (assistance) in a such a way that would be meaningful on the ground and that’s what matters,” Ford told PBS’s Margaret Warner in a separate interview Tuesday. Ford, until his retirement one of the State Department’s top Arabists who previously served as US Ambassador to Algeria and deputy US Ambassador to Iraq, is slated to join the Middle East Institute as a senior fellow. He could not immediately be reached Tuesday. Ford is hardly the first Syria mediator to quit in frustration. UN/Arab League Syria envoy Lakhdar Brahimi resigned last month, as did his predecessor Kofi Annan before him. Former US envoy on Syria transition issues Frederic Hof, who quit in 2012, has also become an outspoken critic of US Syria policy. As to why Ford had not previously voiced such criticisms in the three months since he resigned, Hof noted in March that Ford was still on the government payroll and required to adhere to official policy and talking points. Ford “will likely speak out when he is free to do so,” Hof, now at the Atlantic Council, wrote. Meantime, in Syria Tuesday, Bashar al-Assad was expected to be declared the winner in presidential polls being run in government-held parts of the country, in elections that the US and western nations have condemned as farcical and illegitimate. Iran, Russia and North Korea have reportedly sent observers to the polls to try to bolster the appearance of legitimacy. Saudi spy chief Prince Bandar bin Sultan has been relieved of his duties at his request, the official Saudi Press Agency reported Tuesday. “A royal order announced here today that Prince Bandar bin Sultan bin Abdulaziz was relieved of his post as Chief of General Intelligence upon his request and that General Staff Yousif bin Ali Al-Idreesi was assigned to act as Chief of General Intelligence,” the Saudi Press Agency wrote, adding the shuffle is to take effect immediately. Bandar’s acting successor, Gen. Al-Idressi, has been serving as Saudi Arabia’s deputy intelligence chief. No explanation was provided for the move, which came after Bandar had reportedly been recovering from shoulder surgery in the US and Morocco in recent months. Saudi expert David Ottaway told the Wall Street Journal the move could be understood as part of a wider shift in recent months in which the Saudi leadership had found Bandar’s Syria strategy had over promised and under delivered, the paper said. “Mr. Araghchi is a very professional negotiator and also a tough negotiator,” Sherman told Al-Monitor by email on April 11. Araghchi, 53, the lone holdover from Saeed Jalili’s nuclear negotiating team, has previously served as Iran’s envoy to Japan, Asian affairs deputy and, briefly during Iran’s presidential campaign and transition last summer, as the spokesman for Iran’s Ministry of Foreign Affairs. Since Hassan Rouhani tapped Mohammad Javad Zarif as Iran’s foreign minister and lead nuclear negotiator last August, Araghchi has been a key player in the nuclear talks that produced an interim deal last November, and a principal interlocutor in bilateral discussions with the United States aimed at advancing a comprehensive nuclear accord. While Zarif’s willingness to engage with US officials was perhaps not surprising — the affable Iranian diplomat spent almost 20 years in the United States, earning graduate degrees and serving as Iran’s UN envoy in New York during the moderate Mohammad Khatami administration — his deputy Araghchi is less well-known to Western audiences. Though Araghchi earned a doctoral degree at Kent University in the United Kingdom and speaks fluent English, he is not one of Zarif’s so-called “New York gang” or “New Yorkers,” as the Iranian diplomats who studied in the United States and served with Zarif in New York have been dubbed at home. A career diplomat who ascended under then-Iran Foreign Ministers Ali Akbar Velayati and Kamal Kharazi, Araghchi is “not political,” an Iranian scholar, speaking not for attribution, told Al-Monitor. But it turns out that Araghchi was not entirely unknown to US officials before he was tapped as Zarif’s deputy last August and became part of the Iranian delegation that secretly met with U.S. officials a half dozen times in Oman, New York and Geneva last fall to try to advance a nuclear deal. Interviews with former officials by Al-Monitor and US diplomatic cables indicate that Araghchi had a previous engagement with the Americans, at a regional summit in Iraq in March 2007, in which he impressed one observer as “extremely professional,” and constructive in the proceedings, in a rare departure from what were otherwise frustrating and unproductive US-Iranian encounters on Iraq at the time. Araghchi subsequently appeared on the Americans’ radar as a highly effective and press-savvy Iran ambassador to Japan in 2008, in a move some US diplomatic interlocutors read as an effort by the Iranian Foreign Minister Manouchehr Mottaki to “protect” Araghchi from Iran’s hard-line then-President Mahmoud Ahmadinejad, US diplomatic cables show. Other US cables suggest that Araghchi played a quietly helpful background role in urging for the release of an Iranian-American reporter acquaintance, Roxana Saberi, who was arrested in Iran in January 2009. “Araghchi is a young, personable, polished and accomplished diplomat who presents well, argues his case calmly and rationally and who is clearly at ease making public presentations and dealing with the press,” then-US Ambassador to Japan Thomas Schieffer wrote in a March 2008 diplomatic cable to Washington about his newly arrived Iranian diplomatic counterpart in Tokyo. Araghchi, then — as now — Iran’s deputy foreign minister for international and legal affairs, led Iran’s delegation to a summit of Iraq’s neighbors in Baghdad in March 2007, attended as well by then-US Ambassador to Iraq Zalmay Khalilzad and then-State Department Iraq coordinator David Satterfield. The meeting came amid growing US frustration at Iran’s support for Iraq “special groups” conducting attacks against US-led coalition and Iraqi forces. Iran denied providing such support, while at the time making repeated overtures to the Americans that it would be interested to engage on Iraq, US cables show. The United States pursued several trilateral meetings with the Iranians on Iraq during 2007, but ultimately determined they were fruitless and counterproductive. But not so at the first meeting attended by Araghchi in March 2007. Israeli Defense Minister Moshe “Bogie” Ya’alon called US Defense Secretary Chuck Hagel Wednesday to clarify his remarks that described the US administration as projecting weakness and saying Israel should take matters into its own hands on Iran. The State Department had publicly–and unusually forcefully—denounced Ya’alon’s remarks and demanded an apology. Ya’alon, speaking at Tel Aviv University Monday, said the United States “shows weakness” on the world stage, and that Israel should not rely on it to deal with Iran, Ha’aretz’s Barak Ravid reported. Ya’alon’s comments “were not constructive,” State Department spokesperson Jen Psaki told journalists at the State Department press briefing Wednesday. President Obama “has provided an all-time high level of security assistance to Israel…even during times of budget uncertainty, to provide Israel with unprecedented capabilities and options,” Psaki said. “So it is certainly confusing to us why Defense Minister Ya’alon would continue his pattern of making comments that don’t accurately represent the scope of our close partnership,” Psaki said. Secretary of State John Kerry called Israeli Prime Minister Benjamin Netanyahu Wednesday “and protested to him his concerns about these comments,” Psaki said. It’s the second time Ya’alon’s remarks have provoked U.S. demands for an apology. In January, Ya’alon reportedly described Kerry’s diplomatic efforts on behalf of an Israeli-Palestinian peace agreement as a “messianic obsession.” He subsequently apologized. The two defense chiefs “pledged to continue working closely with one another on the range of security issues facing the United States and Israel,” Kirby said. The United States announced Tuesday that it has ordered the Syrian government to immediately cease all operations at its embassy in Washington, D.C. and two honorary consulates in Houston, Texas and Troy, Michigan. Personnel at the facilities who are not U.S. citizens or legal US residents have been ordered to depart the country. “For three years, Bashar al-Asad has refused to heed the call of the Syrian people to step aside…and created a humanitarian catastrophe,” Daniel Rubinstein, the new US Special Envoy for Syria, said in a press statement. “Following the announcement that the Syrian Embassy has suspended its provision of consular services, and in consideration of the atrocities the Asad regime has committed against the Syrian people, we have determined it is unacceptable for individuals appointed by that regime to conduct diplomatic or consular operations in the United States,” Rubinstein said. There are just two Syrian diplomats left at its embassy in Washington, a Syrian contact told Al-Monitor Tuesday, as well as 8 or 9 local employees. The Syrian diplomats in Washington do not have US residency and will have to leave, the contact said. The State Department gave them til the end of the month to depart..
Ayman Midani serves as the honorary consul general of Syria in Houston, Texas. The last Syrian ambassador to the United States, Imad Moustapha, departed in December 2011, to become Syria’s envoy to China. “The United States will continue to assist those seeking change in Syria, to help end the slaughter, and to resolve the crisis through negotiations,” Rubinstein said. The chair and ranking members of the House Foreign Affairs Committee welcomed the expulsions of the Syrian government personnel, and urged the Obama administration to withdraw diplomatic recognition of, and increase pressure on, the Assad regime. “We feel that the illegitimacy of the Assad regime is overwhelming — 10,000 children killed, millions of refugees,” Secretary of State John Kerry said in a State Department chat with university students on Tuesday. Meantime, the Assad regime this week signaled that it “plans to hold presidential elections this summer in all areas under government control and President Bashar al-Assad will likely be one of several candidates to run,” the Wall Street Journal reported Tuesday, citing Syria’s minister of information. The Secretary of Iran’s Supreme National Security Council, meeting with UN Syria envoy Lakhdar Brahimi, criticized international objections to Syria’s Bashar al-Assad running in new elections, and suggested that the UN role in Syria is less than neutral. Brahimi, speaking to reporters at the UN last week, warned if Assad ran in new elections, the Syrian opposition would likely refuse to return to reconciliation talks. But Syria–and its Iranian patron–seen intent on pressing ahead. “Syria plans to hold presidential elections this summer in all areas under government control and President Bashar al-Assad will likely be one of several candidates to run,” the Wall Street Journal reported Tuesday, citing Syria’s minister of information. 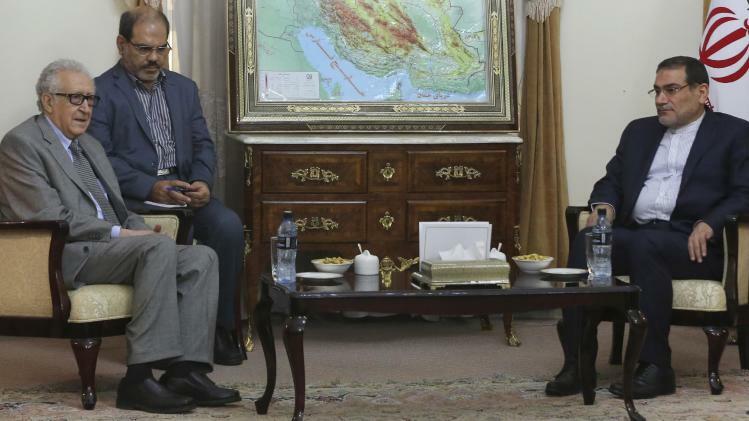 Shamkhani, an ethnic Arab who served as Minister of Defense in the Khatami administration, was expected to play a key role in Iran’s handling of the Syria crisis, Ali Hashem reported at Al-Monitor in September. Brahimi, on a two-day visit to Iran, also met with Iran Foreign Minister Mohammad Javad Zarif and Deputy Foreign Minister for Arab and African Afffairs, Hossein Amir-Abdollahian Monday. Amir-Abdollahian, according to IRNA, said that Iran has proposed a four-point plan for resolving the Syrian crisis. “The details of the plan have not been publicly announced but we are following up on it through negotiations and diplomatic consultations,” IRNA cited Amir-Abdollahian, who published an article on the plan at Al-Monitor (March 5). Separately, the State Department on Monday announced that Daniel Rubenstein will succeed Robert Ford as the US Special Envoy for Syria, as Al-Monitor previously reported. Amid deepening US-Russia strains over Ukraine, two former Obama administration officials say it may be time for the US to explore trying to develop a channel with Iran to discuss Syria, beginning with humanitarian relief. “My bottom line sense with the Iranians is there’s hope for a US-Iran conversation [on Syria humanitarian aid] that is a serious and potentially productive one,” Frederic Hof, a former senior US diplomat advising the Obama administration on Syria and the Levant, told Al-Monitor.in an interview last week. “Humanitarian aid is where to start—establishing localized ceasefires, facilitating aid access,” Stevenson, a former director for political-military affairs for the Middle East and North Africa in the Obama administration, told Al-Monitor in a telephone interview Friday. Focusing on humanitarian issues initially makes sense, he said, especially given reluctance by both sides to hold “major political discussions,” and with both the US and Iran focused in the near term on the imperative of trying to reach a nuclear deal. “On Syria, the challenge on our side is always bureaucratic stove-piping,” Hof agreed. Those “in charge of the US role in the P5+1 will absolutely oppose any kind of cross -pollination or discussion about Syria. So it takes a decision almost at the highest level,” at the Kerry-Deputy Secretary of State Bill Burns level, to try to pursue a Syria channel with Iran. One official who might make sense to tap for such exploratory US Iran talks on Syria, a former official suggested, would be Puneet Talwar, who until recently served as the Obama NSC Senior Director for Gulf affairs, and who has been involved in US-Iran back channel talks to establish a bilateral diplomatic channel to advance a nuclear deal. Talwar was confirmed on Thursday as Assistant Secretary of State for Political-Military Affairs, and is no longer expected to be part of the US team involved in the P5+1 Iran nuclear negotiations. Other possible officials to consider include Salman Ahmed, a counselor to National Security Advisor Susan Rice involved in the recent Syria talks in Geneva, who previously advised Rice at the UN, and before that served as a senior official in the UN Department of Political Affairs; or Rob Malley, Talwar’s successor as the NSC Senior Director for Gulf Affairs, who previously served in the Clinton White House and as Middle East director for the International Crisis Group; or Daniel Rubenstein, the former US Deputy Chief of Mission in Jordan who will be tapped to succeed Robert Ford as the US envoy to the Syrian opposition, Al-Monitor reported..
Iranians in the track 2 discussions have also expressed some problems with the UN role in Syria, Hof said, suggesting that any US-Iran channel on Syria not be through UN auspices. Iran’s Deputy Foreign Minister for Arab and African Affairs Hossein Amir-Abdollahian, writing at Al-Monitor March 5, 2014, proposed a four-part plan for resolving the Syria crisis. In it, Amir-Abdollahian wrote that the “the provision of immediate humanitarian aid is a religious and humanitarian duty,” and that the “UN’s neutral role is significant,” perhaps hinting that Iran found the UN’s role on Syria to be less than neutral. Amir-Abdollahian, a former Iranian ambassador to Bahrain, was among the Iranian officials who in 2007 met with US diplomats in Iraq. The trilateral US-Iran-Iraq talks on Iraq were led on the US side by then US Ambassador to Iraq Ryan Crocker, who found them unproductive. Was Amir-Abdollahian’s piece this month a signal of Iran interest in discussing Syria?